What does it take owning a pet? Time, Responsibility, Compassion, Patience and Education. Being able and willing to spend the time and money necessary to provide medical and overall proper care for the pet. Registering & vaccinating the animal every year. Owning a pet is for life. Animals need attention, care and love. It can be a rewarding experience for the whole family. They provide constant companionship. A pet will provide unconditional love and affection for years to come. Please do not buy from pet stores as doing so encourages the horrible, and ongoing trade of puppy and kitten mills. 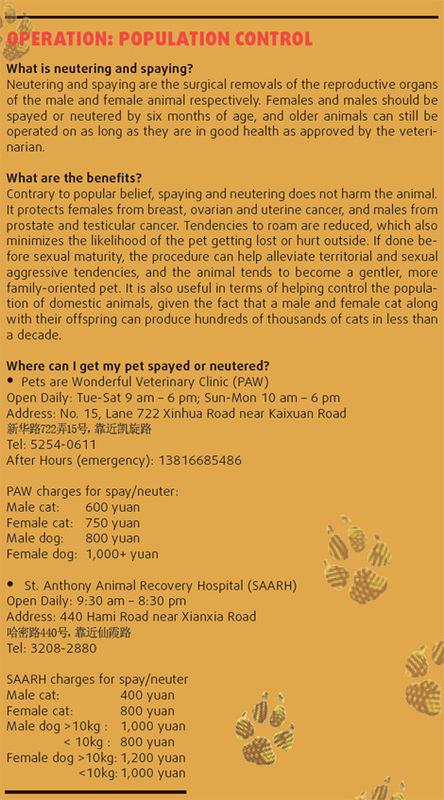 Regarding to detailed process of moving a pet domestically at Shanghai, the following are information at different transport method. 1). 3 days prior to the departure date, the owner will pick up pet to do Vaccination in Shanghai Livestock Farm Veterinary Station (上海市畜牧兽医站) and apply Domestic Outbound Animal Transmit Certificate to Shanghai Animal Hygienic Supervision Institute (上海市动物卫生监督所). 2). The owner must book animal space to airlines in advance, while booking its own air ticket. 3). On the departure date, the owner just need to do the check-in process at check-in counter in airport and pay pet's excess baggage fee. 2). The owner can take pet from Shanghai to other city by car or van. The domestic Certificate is valid for 7 days from the date of issue to transport.